The objective of the work was development of a calculation model for practical prediction of the kinetics of formation of multicomponent endogenous nonmetallic inclusions in the weld metal. The proposed mathematical model is a nonstandard nonlinear boundary problem for a system of diffusion equations with the specific condition on the moving melt-inclusion interphase, and it allows for the kinetics and heterogeneity of the process under the conditions of the real thermal cycle of welding. The calculation program developed as a computer realization of the constructed model allows evaluating in a computer experiment the size and composition of endogenous nonmetallic oxide inclusions, depending on concentration and thermal conditions in the weld pool. 10 Ref., 2 Figures. Gubenko, S.I., Parusov, V.V., Derevyanchenko, I.V. (2005) Nonmetallic inclusions in steel. Dnepr, ART-PRESS [in Russian]. Ozhigov, L.S., Mitrofanov, A.S., Rybalchenko, N.D. et al. (2017) Influence of nonmetallic inclusions in low-alloy carbon steel on service life of NPP piping. Voprosy Atomnoj Nauki i Tekhniki, 110 (4), 59–64 [in Russian]. 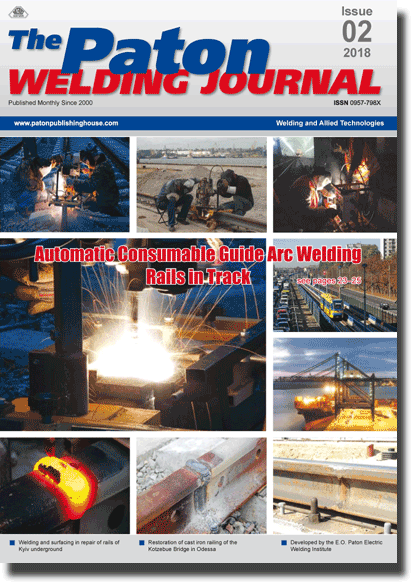 Myasnikova, A.A. (2012) Nonmetallic inclusions and their influence on welded joint quality in manual arc welding. Master’s J., 1, 50–54. Hong, T., Debroy, T., Babu, S.S., David, S.A. (2000) Modeling of inclusion growth and dissolution in the weld pool. and Mater. Transact. B, 31B, 1, 161–169. Grigoryan, V.A., Stomakhin, A.Ya.. Ponomarenko, A.G. et al. (1989) Physical-chemical calculations of electric steelmaking processes. Moscow, Metallurgiya [in Russian]. Pokhodnya, I.K., Demchenko, V.F., Demchenko, L.I. (1979) Mathematical modeling of gas behavior in welds. Kiev, Naukova Dumka [in Russian]. DSTU ISO 6847:2015 (ISO 6847:2013, IDT): Welding consumables. Deposition of a weld metal pad for chemical analysis [in Ukrainian].